Any good auto kerning tools? This question is probably quite naive, but are there any good auto-kern tools? It seems to me that such time consuming yet mechanical process should’ve been automated a long time ago, shouldn’t it? And now we have all of those neural networks, AI and so on. Am I missing something already present? Font Creator has a very good automatic kerning tool built in ! I don't believe there will ever come a day where kerning can be fully automatized. The reason is that kerning, like spacing and designing outlines, is subject to taste and style. It makes sense to kern one typeface differently then the other, simply because it has a different style, or is intended for different purposes. What I've been thinking for a while though, is that something like Bubble Kern might benefit from a slider from Text to Display, where Text kerns everything loosely, and Display very tight. DTL KernMaster can generate OK kerning tables if you know how to use it. I've used several times to generate a draft kerning that I can improve later with MetricsMachine. Also worth mentioning some foundries are happy with Igino Marini's ikern.com services. What I do in FontCreator is use a Kerning Pair table for testing purposes only, then when I am happy with the changes, I copy/paste the new values to the table that is actually used in the font, or run autokern on the table used by the font. The Autokern feature allows the user to adjust the glyph spacing value to make the kerning tighter or looser. One can do this for the full table, or just for the test table (which is much quicker). When I am happy with the glyph spacing factor, I can use that value for the entire font. On my large fonts, it takes a few minutes to run. I have about 72K kerning pairs. I have about 72K kerning pairs. 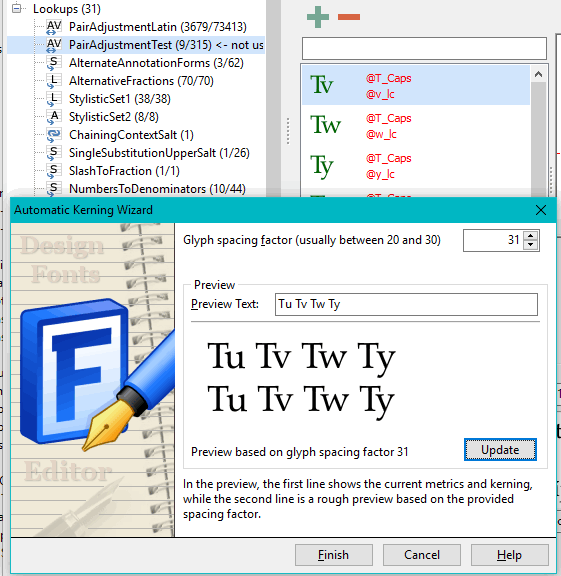 Does FontCreator not support kerning groups? Yes. See the screenshot. 3,679 kerned classes, 73,413 kerning pairs in all. Can FontCreator export the kerning to UFO or a .fea file? FontCreator’s “own format” looks an awful lot like the AFDKO “.fea” format shared by many tools. 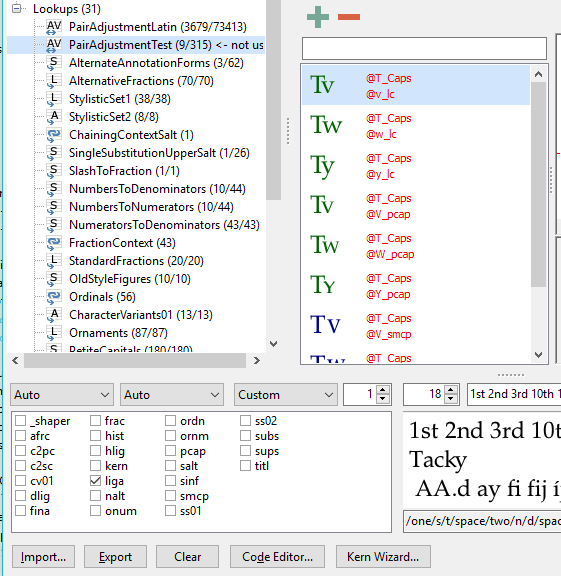 The OpenType layout feature format used within FontCreator is based on the format used by the now ancient and obsolete OpenType Compiler from Rogier van Dalen. We've further extended it to support more recent innovations like feature parameters. @Erwin Denissen Can the latest FontCreator be installed under Vista? I can't find this information in your website. Yes, our font editor should work just fine on Windows Vista. I will give the FontCreator's autokerning feature a try as soon as I have a little time. 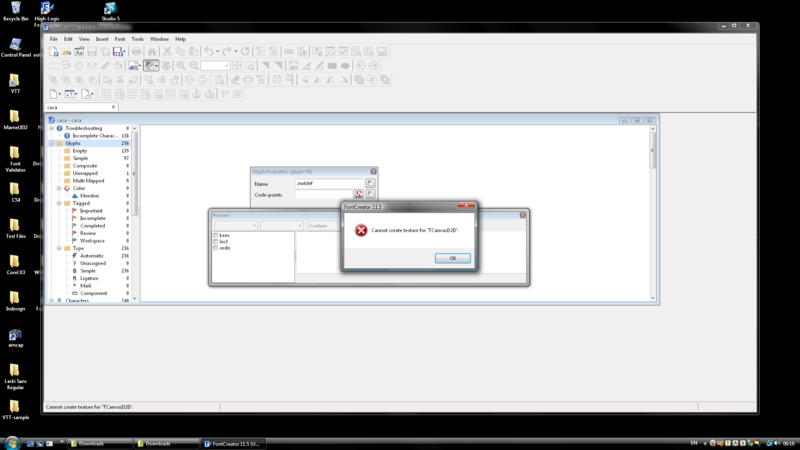 @Erwin Denissen I can't use FontCreator under Vista because this window message pops up all the time. I'm sorry about the inconvenience. We tested it last year, and it worked just fine. Are you running a minimal version of Vista? I suspect FontCreator requires Vista SP2 + Platform Update or higher. I hope this helps. I suspect that either it is based on the AFDKO “fea” language (which would be quite OK as far as I know), or conceivably vice versa. Not that it is a big deal either way. I look at a string of glyphs, and I "auto" matically understand which ones to adjust. As soon as I figure out how to "product-tize" this I will let you know.